Lone Terrorism refers to violent acts carried out in support of some group, movement, or ideology by a single individual in the absence of direction by an outside group. How do we ensure a comprehensive assessment of risk factors for such tragic acts before they happen? 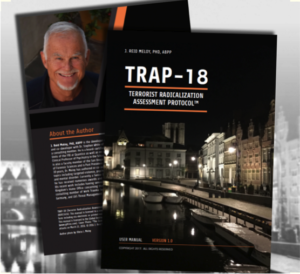 Available exclusively from the Global Institute of Forensic Research, the Terrorist Radicalization Assessment Protocol-18 (TRAP-18) Manual is designed to code for 8 proximal warning behaviors (such as pathway, fixation, identification, and last resort) and 10 longer term distal characteristics (such as personal grievance, ideological framing, failure of sexual pair bonding, and mental disorder). The TRAP-18 provides a means by which mental health, intelligence, law enforcement, and security professionals can organize accumulating operational data on a person of concern, and therefore plan for his or her risk management to reduce the threat of targeted violence. Research concerning the TRAP-18 is ongoing in both North America and Europe, and findings are demonstrating both inter-rater reliability and criterion validity. IMPORTANT: Each TRAP-18 Manual User requires access to a license for the TRAP-18 Manual. Click here for contact details and pricing to purchase multiple-user licenses.